Artistic darning. When upgrading a clothing is very necessary type of work is art darning, if the defect is of old cloth cannot be avoided when cutting. Products of cloth, woolen and other dense tissue damage can be corrected so that they are inconspicuous or almost invisible from the front side. There are several ways the art of mending: stukova, resposive, interweaving unilateral insert, double sided interweaving, simple mending, etc. the choice of the method of repair is determined by tissue structure, the nature of the defect and the degree of deterioration of the repaired tissue. Stykovka used in the repair of cloth and woolen fabrics. Way of resposive masked the seam line after stacki patches by machine is easy when repairing crumbling wool and wool blend fabrics. By using inserts to repair the products made of expensive fabrics: wool, tricot, etc. Bilateral weave used in the repair of products damaged by moths, minor tears, burns, when the size of the injury does not exceed 2-2,5 see in This way repairing fabrics having a simple structure.Interlacing makes threads removed from repaired products separately on the basis of and duck fabric. Clothes repair way textile darning is done with little destruction of tissue. This is a high quality and complex kind of repair, as the weave of fabrics, particularly suiting, is very complicated. When stykovochnye stitches to repair tears and openings clear of crumbled threads, cutting them with scissors, and then sew them together with a thin needle with silk thread to match material. When smokovce edge parts of the front side must be carefully combined to make the fabric line up exactly. Stykovka produce from the inside of components; the stitches come closer to the front surface of the fabric, but so that they were not visible from the front side (Fig.238). When overlaying stykovochnye stitches sew the fabric in one direction and then in another. Frequency stitches - 5-7 1 cm stitch. Repair tissues with increased fall use the so-called box of patches. The skillful execution of this type of repair gaps become completely invisible (Fig.239). Patch rectangular cut more of the hole size 2-3 cm and put the wrong side on the front side of the part so that its edges came to the hole equally on all sides.Figure the patch must match exactly with the details drawing. Patch primetyvajut frequent hand stitches at a distance of 1-1,2 cm from the edge of the hole part. To primerki from the edges of the patch pull out the threads of the warp and weft so that the two sides formed the ends of the warp threads, with the other two ends of the weft threads. The length of the ends of the warp threads and weft should not be smaller than 2-3 cm then begin to smokovce. In the needle, put both ends of the thin and strong thread to the other end form a loop.The needle end is injected into the tissue at the edges of a patch and pass it underneath the top layer of weave, grabbing the threads of the fabric lying on top of a segment 1 cm, remove the thread on the wrong side, not dragging fully loop thread. Then in thread loop is passed the end the filament from the edge of the patch and dragged it inside out details. So alternately dragged all the ends of the warp and weft of the patch. With a small damage of fabric on her darn machine or by hand. For darning by hand (Fig.240) the thread is pulled out from the open edges of the updating of clothes or specially selected by color, shape and thickness. Prepare the damaged area so that the warp and weft in all four corners are aligned at right angles to one another. The strands forming the mending, lay on the line direction of the main threads, and then in the direction of the weft threads of the fabric. When turning the darning thread should form a small loop that is equal to 1-1,5 mm. The strands forming the darn twist staggered, i.e., one thread take the needle, and the other is a underneath. The exact interleaving of threads can get any pattern darning, meeting the fabric of the spare part. When damaged area of not more than 10 X15 mm darning produced on the sewing machine, laying on the damaged place a few machine stitches, arranged in a zigzag (Fig.241). From the inside of the part under the damaged area enclose a piece of the same fabric or matched in color and texture. After the imposition of the lines of the cut edge of the overcast. Decorating the seams. The main element of any embroidery is stitch. The result is a rhythmic repetition of stitches, their location and grouping in a certain order formed simple and complex stitches. Suture needle forward (Fig.242) is a discontinuous line of stitches. Progress from right to left. Stitch length and the distance between stitches should be the same. This simple stitch, you can perform easy pattern trim for baby dress, if you repeat it the stitch under the stitch a few rows or a little shift in different ways the beginning of each row. The seam can be carried out not only on the direct thread, but in any direction. In this case, to embroider better in definitely spaced lines or pattern. Stitches can be done without starting threads, in my eyes, but sticking to the same length.They should not be very long, not to cling and not stretched in the wash and in the process of using the product. Embroidery stitches you can use when joining two fabrics in updated product, positioning it over the seam line. The seam line (Fig.244) similar to the engine line. Progress from right to left as well as the seam behind the needle, only the stitches follow each other without gaps. Stalked the seam (Fig. 245) is very common in the embroidery. They can embroider the whole pattern. Used in combination with other stitches. As follows: from the exit point of the pinned thread (1) count down 6 threads to the right and pierce fabric (2). Gain on needle 3 threads in the opposite direction (3) and pull it in. From a puncture to the right again counted 6 threads (4) and make the 2nd stitch. Sew to the right edge of the sample, while maintaining that the working thread all the time lay to one side. Fix the thread. Inside out turned seam stitching. 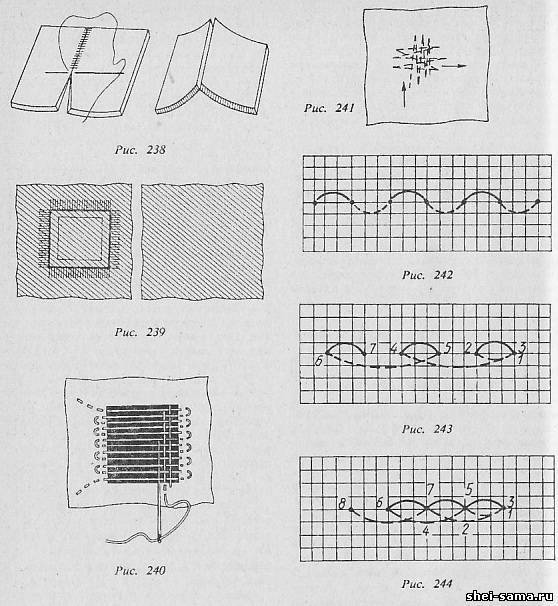 Stalked seam embroider patterns of various configurations.It is found in combination with other techniques (Richelieu, gadjeva, etc.). The suture chain (or chain stitch) is reminiscent of the chain. It uses the principle of formation of the working thread loop. On the inside it turns out the place. Running seam in any direction, as convenient. Working thread is fixed on the front Auron (1). Put the needle to the exit point of the thread (2). Make thread loop and hold it with your thumb. Puncture count 5 threads, put them on the needle (3) and pull the needle inside the loop. Following the puncture and make the exit point of the thread (4), again gaining on the needle 5 threads (5) and pull it inside of the resulting yarn new loops, etc.Loops tighten evenly forming a proper roundness, but not too loose, otherwise the thread will fall behind the fabric, and the seam will turn out ugly. After finishing a row, the last loop lock stitch over the edge. Fasten the working thread (Fig.246). 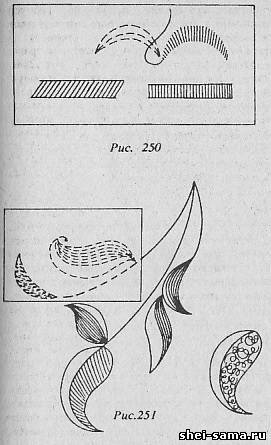 If the loop is made the same as the last link in the chain of the chain stitch, joining groups, you can get the figures (legs, leaves, flower, ear, Fig.247). In loop the seam and a loop of the working thread. Seam has many options: can be rare and dense, with smooth and rough edges. 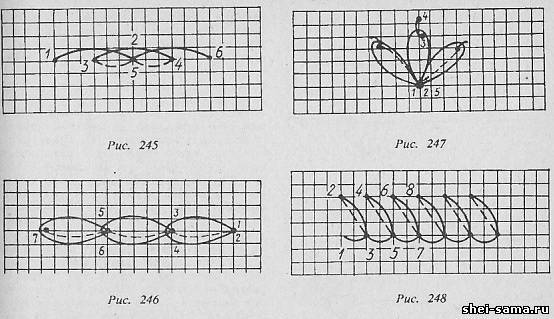 Lead from left to right, the direction of the loop itself (Fig.248). As I begin, to secure the working thread so that it immediately can be hidden with a few stitches of the seam. Pull the needle on the front side below the fixed thread (1). Holding the thread to form a loop, make up a vertical stitch length 0.5-0.6 cm (2). Direct the needle downward, tilting slightly to the right, and pull it next to the puncture 1 inside the loop.Hold the thread until then, until the noose tightened on the edge of the seam (tighten evenly, so as not to ruin the edge). Next, make a new stitch by piercing the fabric from the top (3) down (4) and pulling the needle inside the loop of the working thread, etc. the Seam should be in the form of a smooth and dense strips of a width of 0.5-0.6 cm Buttonhole seam can be carried out not only in a straight line, they are very complex and delicate, and the application contours, fixed edge on the bias strands are festoons.To the edge was more robust, convex, buttonhole stitch are doing with the flooring (Fig.249): at the intended point of stitch a few rows forward, seam the needle (closer to the edge stitches are placed more densely), across which are then looped stitches of the seam. Glideway cushion (Fig.250) is a series of tightly adjacent to one another parallel stitches. Live the cushion on the front side of vertical stitches, with the wrong side is slightly beveled. The seam was smooth, pulled on the sample for two horizontal strands at a distance of 0.5 cm from one another. Fasten the thread with a few stitches, stitched along the future row 1st stitch on the front side doing strictly vertically, all of the following are placed in parallel to it with the space between the two rows of standing stitches one thread of fabric.It is important that the stitches evenly, not too tight and not very loose tight then the seam will be smooth, beautiful. Glideway roller is the main stitch used in machine drawings embroidery techniques, cutwork, applique, surface. A great opportunity to give ordinary sewing machine stitching. The location of the figure in different directions with different density were attached to the picture lightness, mobility and expressiveness (Fig.251).